Was There a Leak at the Fed? 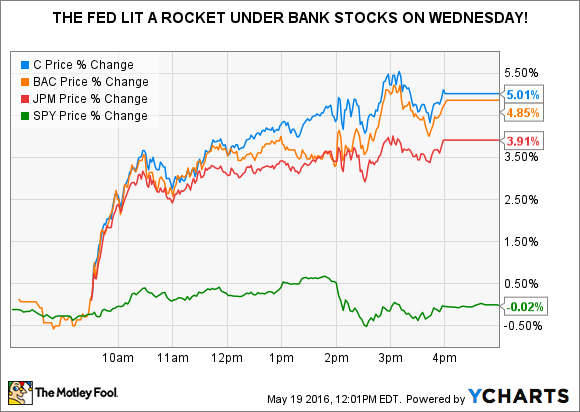 Wednesday's release of the minutes of the Federal Reserve's monetary policy meeting produced some unusual price action in bank stocks. U.S. stocks are lower in early afternoon trading on Thursday, with the S&P 500 (SNPINDEX:^GSPC) and the Dow Jones Industrial Average (DJINDICES:^DJI) (DJINDICES: $INDU) up 0.83% and 0.87%, respectively, at 12:30 p.m. ET. Today marks one year since the Dow last made a new high -- the longest stretch since 2012, according to The Wall Street Journal (the S&P 500 will celebrate the same anniversary on Saturday). On Tuesday, Jan Hatzius told Bloomberg Television that "[t]he market's underestimating [the Federal Reserve's] willingness to follow through on what they say," adding that "[i]f you look at where the yield curve is priced -- how little normalization of monetary policy is discounted -- that's very striking." He was exactly correct. Yesterday's release of the minutes of the April meeting of the Federal Open Market Committee meeting (the FOMC sets policy interest rates) took the market by surprise with the Committee's hawkish tone. The adjustment was swift and significant: Based on Fed Funds futures prices, the market's estimate of the probability of a rate rise at the next meeting in June jumped to 34%, from 19% just prior to the release, and just 4% at the beginning of the week. C Price data by YCharts. Bank profits are dependent on interest rates: Banks earn the difference between their cost of funds and the rates at which they can lend, which are tied to interest rates. It's therefore unsurprising that the prospect of higher rates should lift bank shares. Data source: Author's calculations based on data from Bloomberg. There's one possible explanation: There was a leak of the minutes from the Fed to certain market participants. First, are we certain the minutes were indeed the cause of yesterday's bank share returns? I looked at the daily returns of the KBW Bank Index relative to the S&P 500 and found that yesterday's outperformance -- nearly four percentage points -- is greater than on 99 trading days out of a hundred going back to February 1993. With no other major news to affect bank stocks yesterday, it's a sure bet the meeting minutes explain yesterday's price action. Did a leak occur? All told, that seems unlikely (although it has happened before): If it did, why didn't it show up in markets that are tied directly to the fed funds rate -- the interest rate futures market? Even if it had, this would be a genuine problem for traders, not long-term fundamental investors. For the latter group, yesterday's action is more interesting in that it appears to confirm the shares of the top banks were undervalued. That continues to be true, yesterday's repricing notwithstanding.